By way of an introduction to Richard Cawthorne joining Business Travel News as Visiting Editor (see BTN’s Visiting Editor in this issue) he has written a travelog about Western Australia, a practical destination from the UK, but perhaps not that popular due to the distance involved and no direct flights. The beach he describes is a long way from Perth, Capital of the State, but clearly worth the effort. I am standing on a perfect beach fringing the Indian Ocean on the far side of the world wondering why it took me so long to get here. Western Australia had not figured particularly highly on my list of destinations to see, possibly because of its perceived remoteness, but then my son emigrated and I was provided with the necessary impetus to make the journey. The beach in question is part of the Monkey Mia Dolphin Resort, an attractive property attached to the renowned Monkey Mia wildlife refuge north of Perth – well north, since in my case it was 856 km or around 535 miles from the Perth suburb where I was based, through large tracts of almost nothing otherwise known as the Outback. 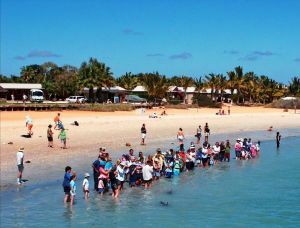 A souvenir plaque in the gift shop sums it up: "Monkey Mia – a bloody long way". But it is worth the journey and in any case you have to expect vast distances and long drives if you want to get anywhere. The resort enjoys a great location and is laid out in typical tropical style, with chalet-style bungalows set along sandy tracks and trees by the sea. The style is Aussie informal, which means very informal, extending even to the resort's fine-dining restaurant, the Bough Shed. I scored heavily by being allocated Room 10, almost on the beach, for my two-night stay – an impressive location. Amenities included a basic kitchen with fridge (but no cooking facilities) and tea- and coffee-making tray. The bed was especially comfortable and there was a patio with lounge chairs from which to observe the passing scene, including three emus that wandered past several times a day. The main disappointment was the non-appearance on both mornings of the dolphins for which the resort is noted but which had been spooked by a cyclone further up the coast and stayed out to sea. Guests were treated to a guided tour of the beach instead, during which we learned among other things that the waters hereabouts contain quite a large number of nasty creatures that Poms like me are well advised to avoid. The setting more than made up for it all, though. Well briefed about the length of the journey to Australia, I had arranged to have a break in Hong Kong, where I flew by British Airways, before continuing to Perth by Qantas. If you have the time, there are several such stopover options, including Singapore and the South Pacific, to alleviate the effects of 23 hours in the air and they are well worth exploring. My main focus, however, was Oz, so it was exciting to descend into Perth’s modern – and busy – airport at breakfast time one bright and sunny morning and take the drive through a bustling skyscrapered city on the verge of a working day. Later during my stay I indulged in one of the latest fads here, which is eating kangaroo, though I had done that a while before at D’Arcy’s restaurant in St Albans. On another trip north, I drove 400km to explore the bush, finishing in Geraldton and enjoying a rock lobster dinner at the Boat Shed (recommended, should you ever make the trip). On the way back, I explored the Pinnacles Desert at sunset, one of many outstanding tourist sights to be seen. I went south to the Margaret River region and its wineries and found some familiar labels and many more unknown on the UK market. Out for dinner at the Goose restaurant on the shore at Busselton, a popular touristy town on the way south, I learned that what we call a grouper is known here as a groper. I leave the rest of the conversation to your imagination, but the fish was good. Talking of language, several restaurants have what passes in this laid-back land for a dress code, including the request that patrons avoid wearing thongs. Before you start to wonder, as I did, how they can tell, I should explain that thongs is Australian for flip-flops rather than underwear. My first visit to WA was in April and May, when the weather is routinely hot and sunny with winter chills beginning to set in during the evenings. I made a return trip at Christmas and New Year, when daytime temperatures hover around the mid-30s, and then again in (UK) springtime, which is autumn in Oz. I have enjoyed every trip. The famously informal lifestyle is easy to adjust to and the people are extremely friendly. I have yet to have a bad cup of coffee. 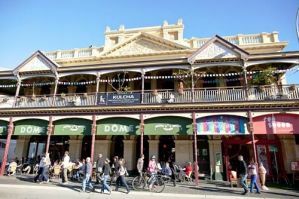 Perth is big-city interesting and its trendy suburb, Fremantle, possibly the last hang-out of hippiedom, rewards several days of eating and nosing around the eclectic mix of bookshops, cafes, galleries and such. Buses and trains are reliable and cheap and are a great way to meet the locals. I too have visited Western Australia Rottnest Island is a great place to spend a couple of nights. No cars allowed and a lovely little marsupial called a "quokka" to see. Also, further north is El Questro. A true outback cattle station. The Homestead is true luxury accommodation, or stay in a luxury permanent tent, as I did. There is a lot to see and do in the Kununnarra area. A true artists colony. Sheila Randall, Atlanta, Ga., U.S.A. I love Western Australia. Cable Beach, Broome, sunsets over the Indian Ocean are magnificent. Also, a visit to El Questro outside Kunnunnara along Gibb River Road is extraordinary. It's a million acre cattle station with the luxury Homestead accommodation and tented accommodation too, with comfortable beds and en suite. Great writing. I'm an Aussie Specialist. I've too have been to Western Australia and visited Fremantle, Perth, Busselton and Margaret River. In addition I've been up to Kunnunara and out to El Questro. Also a very interesting area to visit and stay. It's not open in the Wet season. I've been to Oz many times, and this was the most memorable, apart from a trip up the Murray/Darling river in a paddle wheeler.